American manned spacecraft module. 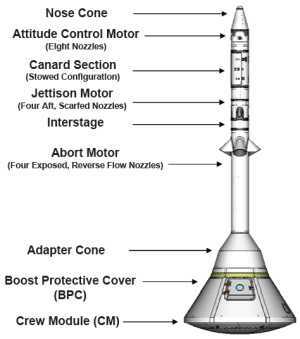 Orion launch abort system; consists of launch escape tower, adapter cone, and boost protective cover. Provides emergency crew escape during early boost phase of ascent to orbit. Status: In development 2016. Thrust: 2,253.00 kN (506,494 lbf). Gross mass: 6,176 kg (13,615 lb). Unfuelled mass: 3,696 kg (8,148 lb). Specific impulse: 250 s. Height: 11.60 m (38.00 ft). Diameter: 0.40 m (1.31 ft). Engine layout follows Soviet Soyuz/TKS design practice as opposed to earlier US Mercury/Apollo designs. RCS Coarse No x Thrust: 8 x 11 kN. RCS specific impulse: 227 sec. Family: Manned spacecraft module. Country: USA. Spacecraft: Orion. Propellants: Solid.